Adult Protective Services, under Central Mississippi Planning & Development District – Senior Services Division, investigates the allegations of abuse, neglect, and exploitation of “vulnerable persons” residing in private home settings, as well as any follow-up services provided by the Senior Services Division to those vulnerable persons as a result of the investigations. Mandated reporters and anyone who suspects abuse, neglect, and exploitation of a Vulnerable Person. Any person including, but not limited to, the following who knows or suspects that a vulnerable adult has been or is being abused, neglected or exploited shall immediately report such knowledge or suspicion, MS Code title 43- 47-7. Observation, knowledge or suspicion of physical, sexual abuse, self-neglect, neglect and exploitation are grounds for a report. residents or patients, regardless of age, in a care facility. Protective services cannot be forced upon a mentally capable vulnerable person. Name, address and telephone number of caregiver, if different from the alleged perpetrator. The purpose of the investigation is to determine the validity of the report and to assess the need for protective services. Services from the agency are intended to preserve the vulnerable person’s rights to a least restrictive setting while maintaining his or her well-being. State law requires investigations be initiated within 48 hours if immediate attention is needed, or within 72 hours if vulnerable person is not in immediate danger. Report abuse occurring within licensed care facilities (i.e. nursing homes, personal care homes), or unlicensed personal care homes with four or more residents unrelated to the operator to the District Ombudsman at 601.981.1516, Mississippi State Department of Health at 800.227.7308, or the Office of the Attorney General, Medicaid Fraud Control Unit at 800.852.8341. CAN CMPDD CRIMINALLY INVESTIGATE AND PROSECUTE A PERPETRATOR? No. CMPDD does not conduct criminal investigations. However, CMPDD files a preliminary report of its findings to the Office of the Attorney General, Vulnerable Adults Unit within 48 hours if immediate attention is needed, or within 72 hours if vulnerable person is not in immediate danger, to determine whether the vulnerable person is in need of protective services. The Vulnerable Adults Unit conducts criminal investigations and prosecutes the perpetrator who has abused, neglected or exploited a vulnerable person living in a private setting. CMPDD is required to file a report with the local district attorney’s office and the Attorney General’s Office when there is reasonable cause to believe that a caretaker or other person has abused, neglected or exploited a vulnerable person. 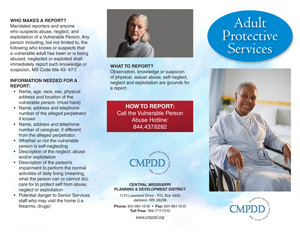 For a copy of the Adult Protective Services brochure, CLICK HERE.